How San Francisco's Ingleside District got it name. If I was a betting man, I'd wager that every resident of the Ingleside has asked two questions: What is an ingleside, and how did this neighborhood get that name? 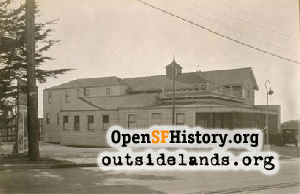 Ingleside has been used as a place name for the area since the 1880s, when Ocean Avenue was just a dirt path branching off San Jose Avenue, used to reach Lake Merced and Ocean Beach. Fresh air and wildflowers drew some travelers out, but most of the horses and coaches were headed for the roadhouses that started doing business around the lake and beaches in the 1850s. These establishments featured food, drink, and entertainment that ranged from bowling alleys to card games. The prominence of individual roadhouses reflected the road's changing name in the early years. 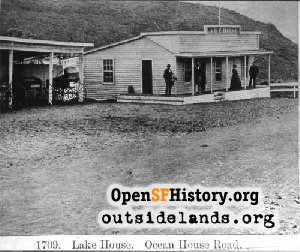 In the 1850s most people called the path "Lake House Road," after a small saloon with a front porch overlooking Lake Merced. 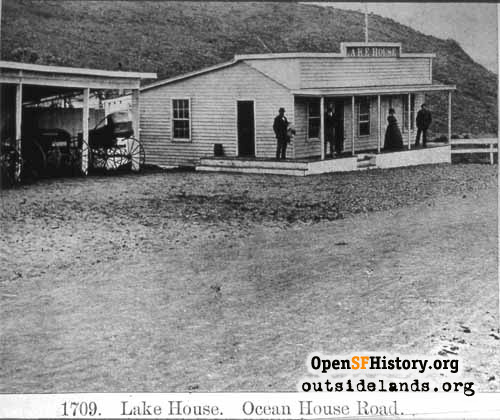 In the 1860s it became "Ocean House Road" in recognition of two-story roadhouse next to a horseracing track that operated from 1865 to 1873 near today's Eucalyptus Drive around 25th Avenue. The operator of the Ocean House was a well-known personality and host originally from New York named Cornelius Stagg. Ocean House business went up and down depending on the weather, the racing season, and the popularity of certain horses. Stagg also had money problems with a woman he often, perhaps inaccurately, introduced as his wife. One newspaper reported the Mrs. Stagg "lived a wild life, spent her time in dissipation with a retinue of admirers, was vastly lavish and reckless in extravagance of every description," and in six years ruined Stagg financially. The Ocean House burned down in the early 1880s; Stagg's wife took off for New York; and the well-known host moved on to a new venture. 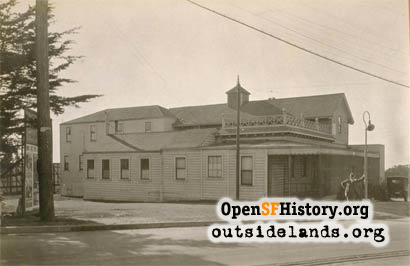 In 1885, he opened a new roadhouse at the southeast corner of the Ocean Road and today's Junipero Serra Boulevard, and named it the Ingleside Inn. Ingle is a Celtic term for a domestic fireplace, and the source of the words inglenook—an alcove built into a fireplace that is usually large enough for chairs or a small table—and ingleside, an area beside a fire. Stagg obviously felt that a term calling to mind a warm and welcome place beside a fire worked well for a roadhouse at a foggy rural crossroad. Stagg's reputation and hospitality made the Ingleside Inn a well-known stop for, in the words of one newspaper, "persons out for a drive or a good time." Stagg provided excellent meals, but despite the use of the word "inn," it isn't clear that the Ingleside accepted overnight guests. (Many also referred to it simply as "Ingleside House.") In short time, it was common practice to call the surrounding area "Ingleside," and some city maps followed suit. Stagg certainly didn't discourage the practice. While registering for a room at a downtown hotel he would often list his residence as "Ingleside City." In 1890, when millionaire Adolph Sutro decided to subdivide some of his land south of Ocean Avenue (which he preferred to call "Grand Ocean Boulevard"), he declined to name the development Ingleside City. Instead, Sutro called his new neighborhood "Lakeview," and the modern-day grid of Ingleside's streets—Ashton Avenue to Harold Avenue, Ocean Avenue to Lakeview Avenue—comes from this project. In 1895, Stagg was shot and killed at his roadhouse by masked thieves who got away on bicycles with only $4. The sporting man and host had been on the verge of bankruptcy, and missed by just a few months the big break that would have boosted his business. Next door to the Ingleside Inn, some of the richest men in San Francisco had bought more of Sutro's land. On it they built a new opulent venue for thoroughbred racing called Ingleside Racetrack. Ingleside Racetrack opened in November 1895. The race crowds supported and spawned new roadhouses and other businesses, and Sutro's slow-selling Lakeview tract finally began to blossom with cottages for track employees. 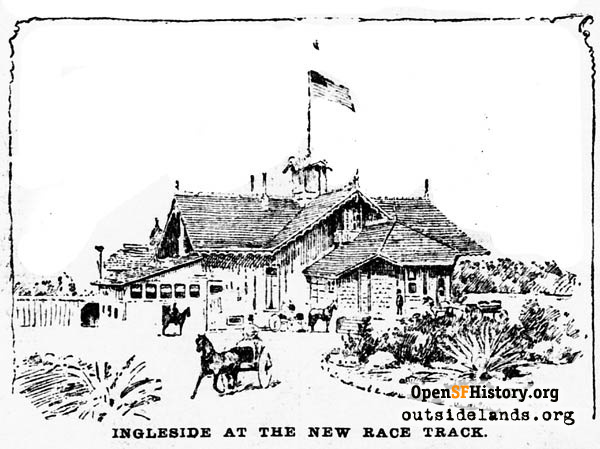 Thanks to Stagg's roadhouse and new horse track, the word Ingleside had come to be associated with a day of recreation and gambling; so it's not surprising that when a dog racing facility opened on the north side of Ocean Avenue, just west of Phelan Avenue, the owners called it the Ingleside Coursing Park. Sandwiched between two Ingleside tracks, and with many of its residents dependent on both for their living, Lakeview quickly became known as Ingleside as well. Ingleside Racetrack closed in 1905, and in 1910 the Urban Realty Improvement Company bought the land to build the residence park it named Ingleside Terraces. Cornelius Stagg's Ingleside Inn was taken over and run by later owners until it closed in the 1920s. For years the site was occupied by a gas station; over the last couple of decades it's been home to various banks. Not all of San Francisco's place names have held on. Happy Valley, the Latin Quarter, and Oceanside were all neighborhood names that gave way to new labels. Perhaps that can happen here. Since the 1960s, the term O.M.I.—coined in the 1960s from the first letters of the Oceanview, Merced Heights, and Ingleside neighborhood names—has been used more and more frequently for the general area. 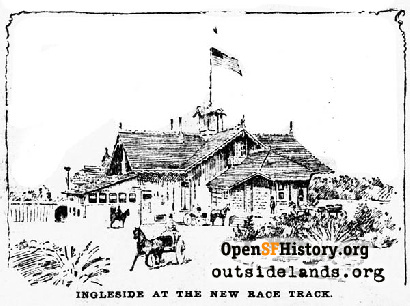 But as a betting man, I'll wager that Ingleside, from 1880s roadhouse, to 1890s racetracks, to twentieth century residential neighborhoods, has become a permanent part of San Francisco's vocabulary. Page launched 22 February 2011.